"A story like mine should never be told, for my world is as forbidden as it is fragile. Without its mysteries, it cannot survive. I certainly wasn't born into the life of a geisha. Like so much in my strange life, I was carried there by the current." In the days of the Hollywood studio system, the prestige projects were the ones with scope. A cast of thousands. Costume departments working overtime. The fact that the studio was spending big bucks meant audiences could expect a visual feast, and the films often cleaned up at awards time, whether there was story to match the spectacle (even the much maligned Cleopatra was nominated for best picture). Memoirs of a Geisha feels like an old studio picture. It's a lavish period piece, set in the ornate, ritualized society of pre-WWII Japan, and there's no question that we're seeing a lot of money onscreen. But even as the film introduces us to a strange new world, the story never goes anywhere new, and the end result is more than a little tedious, and never very engaging. This is the story of Chiyo, who as a young girl (Suzaka Ohgo) is sold, along with her sister, to Mother (Kaori Momoi), head of a geisha house. Chiyo's sister is immediately rejected, but Chiyo is allowed to stay in the house and work as a serving girl, with the hope that she may one day begin her own training to become a full geisha. She befriends Pumpkin, another young girl, and butts heads with Mother and Hatsumomo (Gong Li), the head geisha, vile and impetuous. One day, in the street, Chiyo encounters the Chairman (Ken Watanabe), a kind man who buys her a treat. The young girl is smitten, and, seeing the Chairman with several geishas, swears to become one herself and meet him again. Shortly thereafter, another geisha, Mameha (Michelle Yeoh) offers to pay for Chiyo's training, making a bet with Mother that the girl will pay off the resultant debt within six months. It's part of a scheme to wrest control of the house away from Hatsumomo, who stands to inherit it. There is a time cut, and Chiyo, now played by Ziyi Zhang, has excelled in her training. Now dubbed Sayuri, she is the most famous geisha in the city, and Hatsumomo is her bitter rival. The movie spends a lot of time setting all this up, but, surprisingly, doesn't do a very good job explaining the world. We get a loose idea of the hierarchy of the house and the significance of the plotting and backstabbing, but aside from a few scenes of Sayuri practicing her dancing or waving a fan around, we don't really get what it means to be a geisha. We're told the word means "artist", and that they are skilled in conversation and entertainment. They are not high-class prostitutes, and yet a key sequence focuses on a heated bidding war for Sayuri's virginity. The beautiful costumes and dances come off like so much window dressing for a world of strict female subjugation, and it's hard to get invested in that kind of story. Certainly I found Sayuri's decades-long pining for the Chairman less than engaging�he reappears time and again, and though they share only a few scenes, it is their supposed romance that ties the film together. This very Japanese story is populated with some of Asia's biggest stars, though the three principal women are Chinese. It doesn't bother me, as the need for bankable actors is obviously part of making a big budget movie, but it's a compromise worth noting. As is the decision to film in English. I realized subtitles don't spell mass appeal, but it definitely affects the performances. Ziyi Zhang, in her first English role, seems caught up in her words and never connects with the role in the way that made her a star in Crouching Tiger, Hidden Dragon and House of Flying Daggers. Gong Li, on the other hand, relishes her villainous role; if this is the Japanese All About Eve, she's Bette Davis, and the claws are fully extended. I haven't read Arthur Golden's celebrated novel, but it's been on my radar for years, simply because, as soon as it was published, Hollywood began trying to make it into a movie. Spielberg almost did it, and many others have been attached. Rob Marshall, fresh off an Academy Award nomination for Chicago, finally got it done, and it's hard to say whether he was the best choice. Like Chicago, this picture is beautiful to look at, but it's not exactly a pleasure to watch. I never felt swept up into the world of the film; instead, I marveled at how much work must have gone into this kimono or that bit of set dressing. Certainly costume designer Colleen Atwood and production designer John Myhre (who both picked up Oscars for their work) are the real stars, along with cinematographer Dion Beebe, similarly honored. 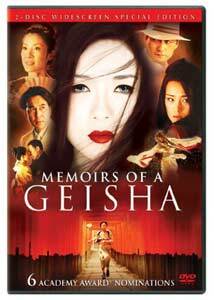 Sony spent a lot of money bringing Memoirs of a Geisha to the screen, but it never connected with audiences the way the novel did. It takes a long time telling a story in which nothing much happens, and all the expensive costumes and elegant photography can do little to dress up a plot full of tired melodrama. At one point, Sayuri notes that, after the war, any cheap whore with makeup and a kimono could call herself a geisha, but that wouldn't make it true. There's an inference there somewhere; I'm too polite to spell it out. Image Transfer Review: The rich production design is well served by a clean, detailed 2.35:1 transfer. Much of the movie is dark, but blacks are solid throughout, and shadow detail and contrast are excellent. The rich color palette is rendered with depth and clarity, and bright scenes look every bit as good as darker ones. I kept an eye out for edge enhancement but didn't spot anything to mar the presentation. The print is certainly very clean, and I didn't spot any artifacting or aliasing. Audio Transfer Review: The DD 5.1 audio track is lively and enveloping. The wide front soundstage presents speech clearly and nicely balances sound effects and John Williams' lush score. The surrounds are active throughout, augmenting the score and carrying atmospheric effects. A few scenes really come alive, with planes flying overhead and back-to-front panning and directional effects. Extras Review: This was Sony's prestige picture for 2005, and its critical failure didn't stop it from garnering six Oscar nominations, albeit all in the technical categories. Not surprisingly, then, this is a packed two-disc set that focuses mostly on the technical details that make the movie worth watching. Disc 1 is bare save for some promo trailers and two commentary tracks. The first features director Rob Marshall and producer John DeLuca; the two cover all the usual details, from adapting the book to mounting such a lavish production. They keep their discussion moving and provide some interesting information, but it's pretty standard stuff, and probably only fans will want to sit through it. The second track, with costume designer Colleen Atwood, production designer John Myhre, and editor Pietro Scalia, interested me a bit more, if only because I like hearing from the "below the line" talent once in a while (and, after all, Atwood and Myhre are the movie's real stars�both won Oscars for their work). Disc 2 is loaded with featurettes that explore just about every aspect of production; all told, there is nearly two hours of material to sift through. From the Novel to the Screen (14m:25s) cover's writer Robin Swicord's adaptation of Arthur Golden's novel, touching on the previous incarnations that almost made it to the screen. The Road to Japan (05m:33s) is all about a research trip the production team took before filming. Geisha Bootcamp (12m:03s) covers the training the actors went through in order to play geishas: sitting, walking, bowing, fan dancing, dialect. Building of the Hamanachi (12m:20s) looks at the effort that went into constructing an entire village to serve as the setting for the film (after location scouting failed to turn up any suitable real-life locales). The Look of a Geisha (16m:16s) covers the geishas' makeup and clothing; director Rob Marshall explains that he took license with the design, lowered necklines, modernized the dress, in order to create something relatable to today's audiences. The Music of Memoirs (09m:50s) is all about John Williams' music (the only time the composer has ever lobbied for a job). A Geisha's Dance (08m:10s) looks at the work and training that went into the dance sequences (which don't play a very big part in the movie). The World of the Geisha (08m:37s) explores the history of the geisha, explaining a bit how they fit into Japanese culture. The Way of the Sumo (05m:55s) provides some background information on the brief sumo wrestling scene. Director Rob Marshall's Story (10m:02s) offers a look at the director's background and working philosophy. A Day with Chef Nobu Matsuhisa (09m:21s) has little to do with the movie; Chef Nobu was a fan of the book and played an extra in the film, and this piece follows him around during his normal job. The food looks great, and if you want to try it out, there are a couple text screens of recipes. Closing out the package are two stills galleries, Behind the Scenes photos and Costume Galleries. Less a movie than an elegant fashion show, Memoirs of a Geisha swaths familiar melodrama in elegant silk, and offers few pleasures beyond the visual spectacle. Sony was expecting big things from this one, and the DVD is suitably packed, but the movie doesn't do much to inspire you to explore the extras.